Frances Doris Kresslein was born in Baltimore, Md. on Oct. 24, 1920. She was the oldest child of Charles Henry and Anna Marie Hofferbert Kresslein. A sister, Kathleen, and brothers George, Joseph, Charles Henry, Jr. and Gerard completed the Kresslein family. Doris was baptized at Sacred Heart Church in Highlandtown, Baltimore. She began school at Sacred Heart School and received her first Holy Communion in Sacred Heart Church. After a family move to Hamilton, Baltimore, Doris attended the remainder of grammar school at St. Dominic’s School. She was confirmed at St. Dominic’s Church by Bishop J. T. McNamara. While in the eighth grade, Doris had “the first thought of becoming a religious.” The idea frightened her. “Rounds of social activities almost overshadowed the idea of a higher life.” While a junior at the Institute of Notre Dame, she sought advice and “finally heeded God’s voice.” Doris graduated from IND in June 1939 and received the bonnet on Aug. 28, 1939, in the Motherhouse chapel. She entered the novitiate on July 26, 1941, and was given the name, Sister Mary Carlissa. She professed her first vows on July 29, 1942. Sister Carlissa spent her first year on mission at St. Thomas Aquinas School in Baltimore as the fourth-grade teacher and teacher of music (1942-43). Sister was always a music teacher, although occasionally she taught a lower grade and was also the church organist and/or choir director. She was stationed at St. Michael’s School, Rochester, NY (1943-45); St. Joseph Monastery School, Baltimore (1945-49); and St. Boniface School, Rochester, NY (1949-56). In Sunbury, PA, Sister taught elementary classes, music and was organist at St. Michael the Archangel School and Church (1956-57). She went to Most Holy Name School, Pittsburgh, PA (1957-59); St. Joseph Monastery (1959-61); Mt. Calvary, Forestville, MD (1961-67); and Notre Dame Prep, Baltimore (1967-69). She worked for the Archdiocese of Baltimore as a teacher of music in the elementary schools, where she traveled throughout the city from school to school (1969-73). Sister Doris then returned to her alma mater, the Institute of Notre Dame, as music teacher (1973-88). During the years of 1988-91, Doris had the care of sick relatives. She worked in the Villa Assumpta finance department for 10 years as Medical Claims Coordinator. In 2001, she retired to prayer and presence at Villa Assumpta. Doris received a Bachelor of Arts in Music Education and Organ from the Catholic University of America, Washington, D.C. in 1948. She earned a Master of Music in Music Education from Duquesne University, Pittsburgh, PA in 1967. Music was always important to Doris. She said, “I had music education from the time I was in second grade.” During her high school years at IND, she added organ and violin and worked to form IND’s first orchestra. As a beginning religious, she was also on the path to become a music teacher. She balanced a busy schedule of classes at Catholic University with teaching classroom music. While at teaching at IND, she would get free opera tickets for her students so they could study the opera in class and then attend the performance. Called “an awesome teacher,” Sister Doris instilled a lifelong love of classical music and opera in her students. She was honored with the Distinguished IND Alumnae Award in 2004. Doris was a woman of strong character. She was good talker, and it was remarked that, “she said what she meant and meant what she said.” She was firm in her opinions and expected much of herself and others. As a musician and teacher, Doris was organized and efficient. A no-nonsense teacher, she was also kind, and students said that it was so much fun just to enjoy music with her. Doris lived the essence of the SSND educational mission. A dedicated religious, Sister Doris had great devotion to the Trinity and said that she always “invoked the Third Person of the Trinity when she began to pray.” She called upon the Spirit as a mantra throughout the day. Doris generously shared her great love of God with the other loves of her life: her family and her SSND community. 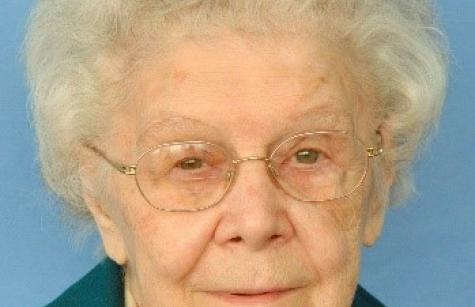 Sister Doris quietly passed away on the morning of March 1, 2019. Doris requested that her body be given for research through the Gift of Life program. She said, “I have given my entire adult life to God and I want to continue by giving someone a better quality of life.” May she now be at peace as she takes her place with the heavenly choir. A memorial Christian Liturgy was celebrated on March 19, 2019 in the chapel at Villa Assumpta by Rev. John McCloskey, OFM Cap., chaplain of Villa Assumpta. Sister Doris’ cremains will be interred at a later date at Villa Maria Cemetery, Glen Arm Rd., Glen Arm, MD. Sister Doris is survived by nieces and nephews.